space for meetings, workshops, and salon nights. Troy has become a lively focus for practitioners and consumers of the visual and performing arts. Within a few blocks of the PhotoCenter is the Arts Center of the Capital Region, the Fulton Street Gallery, several other arts venues, Troy Music Hall, three bookstores, numerous ethnic restaurants, and the Rensselaer Polytechnic Institute and Russell Sage College campuses. Across the street from the PhotoCenter are five dining establishments, including a micro-brewery, an Irish pub, and a Mexican-Irish restaurant, as well as a notable performance venue, Revolution Hall. Troy artists, galleries, and businesses coordinate exhibitions and receptions for a monthly last Friday “Troy Night Out,” featuring the arts and culture of downtown Troy and drawing enthusiasts from throughout the region. reference area with current periodicals and magazines. invitation to exhibit at annual Members Only Exhibition. * To participate in the online gallery, submit a CD with your best images resized to 640 pixels at 96 dpi. Download a PDF membership application! E-mail us with your name, contact information, and type of membership desired to info@photocentertroy.org to join or renew your membership. Expedite your payment with PayPal — https://www.paypal.com. Recipient is payments@photocentertroy.org. Alternatively, you may mail your information and payment to the PhotoCenter, 404 River St., Troy, NY 12180. For use or rental of any equipment, members may be asked to show familiarity with or competence to use equipment. Members are expected to use PhotoCenter facilities and equipment responsibly and assume responsibility for damage due to misuse or abuse. Access to most facilities and services will be limited to members. Some services to some levels of membership will have fees; some facilities have rental fees. Prices include 8% sales tax. To ensure availability of equipment , please reserve at least a day in advance. To ensure availability of spaces, please reserve at least a day in advance. Hours are 5 to 9 p.m. on weekdays (closed Wednesdays) and noon to 6 p.m. on weekends, and will be expanded to meet demand. Volunteer assistance is welcomed. From I-787 take Exit 8 “Green Island” to Troy. Bear right at next two lights to cross over Green Island Bridge. Go left at light after bridge onto King Street. The next two lefts will put you on River Street, one way going south. The PhotoCenter is down the block on the left. From I-87 use Exit 7 for Route 7 East. 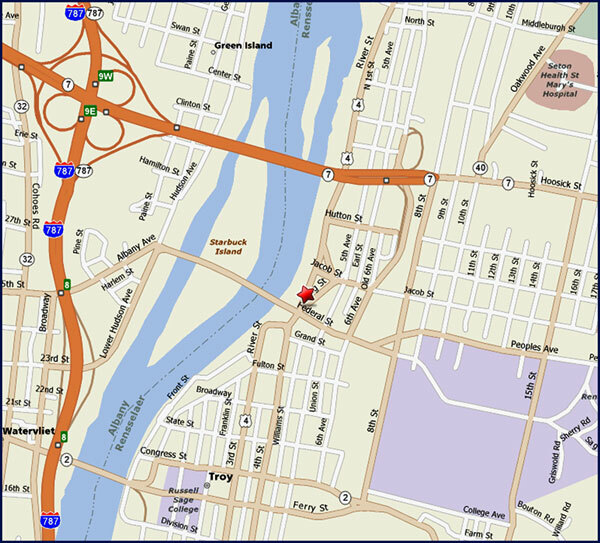 Continue to exit “Downtown Troy, Hutton Street” and proceed on Hutton Street to River Street. (Hutton ends at River Street.) Go left on River Street two blocks to the PhotoCenter. Free parking in City of Troy lot behind River Street after 5 p.m. Entrance across the street from the PhotoCenter. shows linkages between the appearance of early images and the equipment used to produce them. In the retail section of the gallery, we will be buying and selling better used photographic and imaging gear. Consignments are welcome. Gallery members may be eligible for discounts for some of these services.